Life with the McCulloughs: Going vegan for vanity, raising kids on plants, dancing with the stars, and an ex-hunter is born. 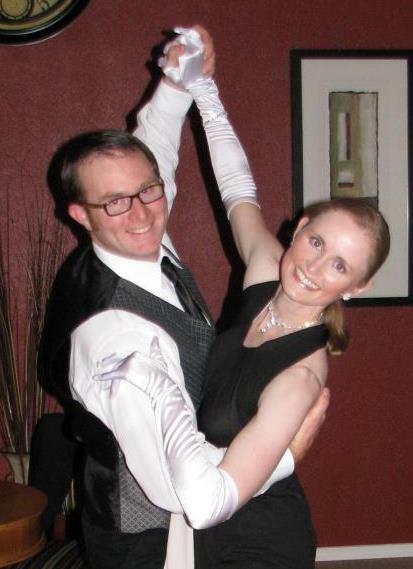 In this episode, we introduce you to Luke & Jilly McCullough, ballroom dance instructors from Central Oregon who are raising their three children in a vegan lifestyle. You’ll hear their joys and struggles as they strive to raise their family in a new tradition. As an ex-hunter, Luke speaks frankly about the struggle of breaking from his family hunting culture, while maintaining strong family values and ties. And, as always, we highlight and analyze News from the Vegan Frontier, let you know about vegan related happenings in and around Central Oregon, and more! Sarah’s Raw and Vegan Cafe, a tiny but inviting space tucked into an out of the way back alley, opened this month and is already very busy. Sarah’s features a wide selection of freshly made superfood smoothies, raw granola, raw crackers and cookies, and special raw entrées and desserts for lunch. Entrées include colorful dishes such as Cream Curry over spinach, “raw chili,” and zucchini and yellow squash “pasta,” and the dessert of the day could be something delicious like raw banana cream pie. All items on the menu are raw, and most are vegan (with the occasional exception of honey in some items). Orders can be placed ahead, but there are always extra smoothies and more on hand. There’s a small seating area inside and more room on the porch for those nice weather days. Raw Uncooking classes are held every Friday at 1:30 p.m. Sarah will teach participants how to make a raw healthy vegan dish. Everyone receives a copy of the recipe and gets to enjoy the meal. Sarah’s is located in the back of Cafe of Life Chiropractic at 519 NW Colorado Ave, Bend. Hours are Monday through Thursday 8am-4pm and Friday 8am-2pm. Is There a Market for Vegan Food? Slaughtering Chickens For “Art” Cancelled in Lawrence, Kansas! A New Egg-Free “Egg” is Hatched: The Vegg! For this month’s vegan bite, we are featuring Raw Chili, courtesy of Sarah’s Raw and Vegan Cafe. VegNet Bend monthly meeting and potluck: 6p, March 28, The Environmental Center, 16 NW Kansas, Bend. Bring a vegan dish, your recipe, and a place setting. This month’s program focuses on leg-hold and Conibear traps being used by trappers in Oregon. Irene Hardwick Olivieri, of TrapFree Oregon, will speak about the group’s efforts to ban such trapping in Oregon. Jennifer Kirkpatrick will speak about her own experience with a leg-hold trap. Learn how to protect yourself and your pets from the dangers posed by traps set up close to hiking trails and other public areas. For more information about either of these events, see VegNet Bend Group on Facebook or vegnetbend.org.